When I was asked by my father, Dr. Arthur F. Pillsbury, to get the facts he told me the first step was to obtain the probate papers. This opened up more questions. I did not know Dr. Ernest and Sylvia were very well to do. This was never mentioned to me. The contentious events around the probate of estates of the couple after their death was never mentioned, either. This conversation with Father took place around 1987. To say I was surprised understates the case. I was stunned when just getting copies turned out to cost $250.00 instead of the $25.00, minus what was left from copying, that had been given me as the cost by the Hall of Records in Los Angeles. I found page after page of stocks and real estate, none of which ever reached the three children. The trustee assigned by the court was Title Insurance Company, which was then struggling against bankruptcy. Even after decades smelling the rat was not difficult. It appears to have been the filing for custody of the children by Samuel Neyhart Ball, Sylvia's younger brother, which caused the delay in naming the chilren's guardian. Samuel N. Ball was a musician who performed for early movies. He had relocated to Santa Monica after the death of his mother in 1906. None of my records indicated a close relationship between the two siblings. If Sylvia's older sister, Cora, had requested custody that would have made sense. The two were close and I found evidence of a continuing correspondence and affection. Sam was a bachelor and as a musican he would have needed an allowance from the estate to provide any care for the children, if such a decision had been rendered. Dr. Harriet also filed for guardianship but with the intention her younger son, AC be the real guardian. In effect, this was a bribe AC paid to ensure he could become the father of the only children of his own family line. AC was the Godfather of the youngest, Arthur Francis, who was named for him. The Pillsbury Family was close. Drs. Harlin and Harriet spent time with each of their sons after they retired. A letter written by Dr. Harlin notes he is not as busy in the First Congregationalist Church of Los Angeles as he was in Auburn, where he had served as Treasurer, but they did what they could. This, and the fact they were in the room when Dad was born in 1904 assisting with the birth and other wise involved in the family’s day to day lives, documents a very close relationship. Sylvia had become a member of this family before she married Ernest because of their shared interests in the rights of women, education and science. Sylvia’s own family did not share these interests or necessarily agree with them. AC never expected to have children because he believed he was sterile. I learned this from my father, who was told this by Aetheline. But he had wanted children, and he wanted his children to share his interests. His own life was dedicated to using photography as a tool to extend human vision and so increase understanding of the natural world. The young man who may have been Aetheline’s son shared her focus on social climbing, an ambition which was meaningless to AC. He did not care what others thought because he could see their limitations. It was these he wanted to change. I am sure it did not take long for AC to realize he had made a mistake in marrying Aetheline but he was a kind person who would never abandon her. The situation was complicated by AEtheline's refusal to either adopt the children with AC, her husband, or to have them in their home for more than 6 months of the year, and only then if she was the 'official guardian' and received the allowance granted to the children's support. Aunt Grace told me this money was not spent on them but used by AEtheline as her own. Wealth did not matter to AC. Any one of his inventions could have made him wealthy – but that was not why he built them. His life mission was changing how people saw the world and their relationship with it. Aunt Grace was a valuable source of information as were some of the Collins cousins, grandchildren of Cora Ball Collins. Dad clearly did not want to discuss it but answered questions if asked. Since he was only five when the accident took place he was not as good a source as was Aunt Grace. Dad did answer questions when asked, and if his source of information was not having viewed something directly, he would cite his source. The court records are all listed in the Time Lines. The stories from Aunt Grace made sense when compared to the timelines. It was a strange story, however. The evidence available supports the conclusion Dr. S. A. Deuel had no deep secrets. He was a practicing physician for many years and had associates and friends with whom he has continuous relations. These people lived near him in an area with small towns. His marriage to Sadie Banfield is the first note of something odd. This was the fact the marriage took place in Sacramento, where he had been raised, with no indication his family was invited to the occasion. He and Sadie lived in different towns at the time and this raises the question of how well he actually knew her before they were married. The child Sadie gave birth to about eight months after the wedding does not appear to have had an ongoing relationship with Dr. Deuel or with his other paternal relations. There is no indication Dr. Deuel and Sadie lived together. Who were they? What are the facts? 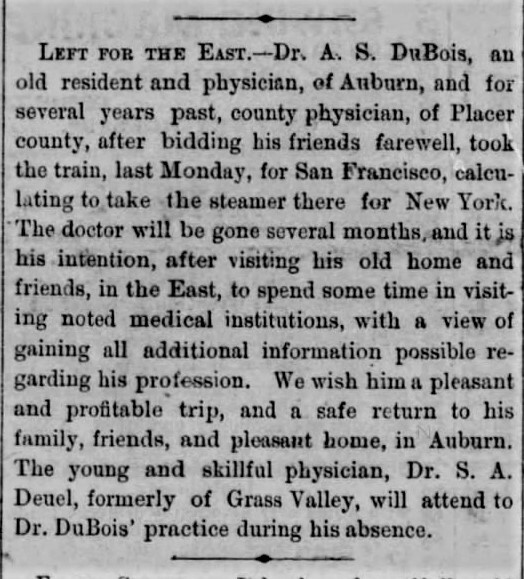 Cipping cited from Time Line - S. A. Deuel is back from medical college and beginning his practice by filling in for a fellow physician in Auburn, CA. His practice will be in this same area, including close-by towns, for over ten years. 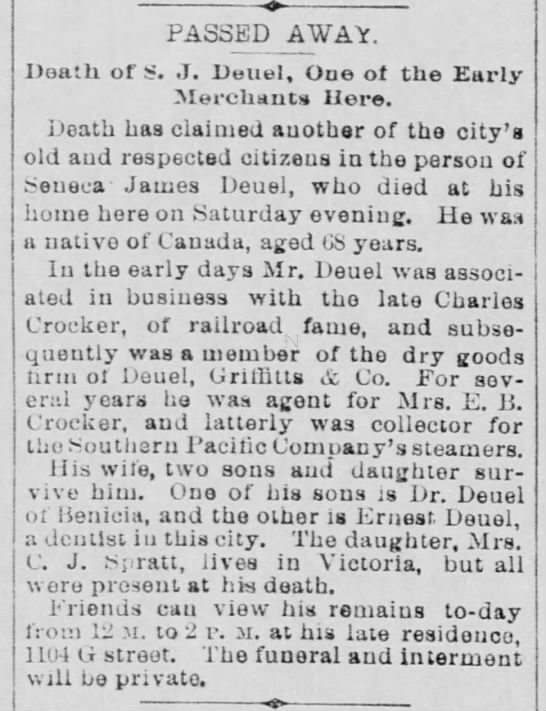 The wedding took place in Sacramento, where S. A. Deuel had not lived for some time. No mention is made of his family being present, though his father was still living and his brother lived not far from Sacramento. 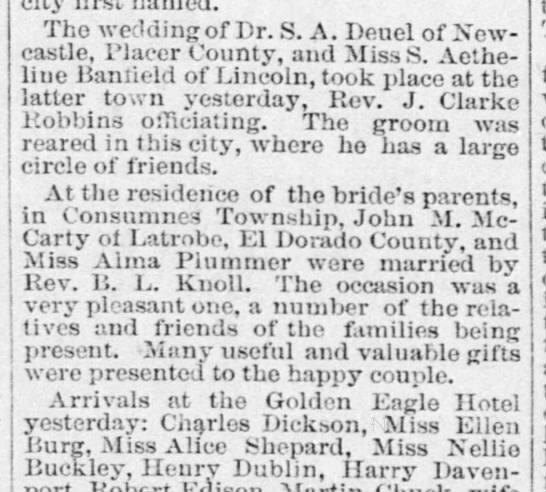 Miss S. Aetheline Banfield appears to have had no family in attendance and did not marry from Lincoln, where she lived. I included the text below to show nothing was cut. Arthur Banfield Deuel will be born July 16, 1892, about eight months later. 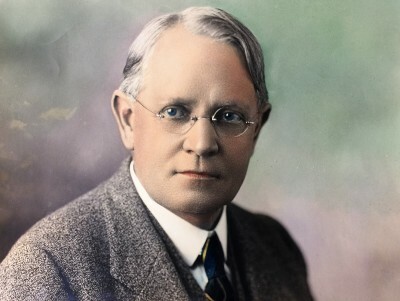 1895 – June 24 - At the death of his father, Seneca James Deuel, Seneca Arthur Deuel is noted at practicing as a physician in Benicia, California. S. J. Deuel was a respected businessman in Sacramento, where his son was raised. S. A. is buried in the family plot in Sacramento. The family are buried in the same plot in Sacramento.